AMD has seen great success with their Never Settle, then Never Settle: Reloaded gaming bundles. 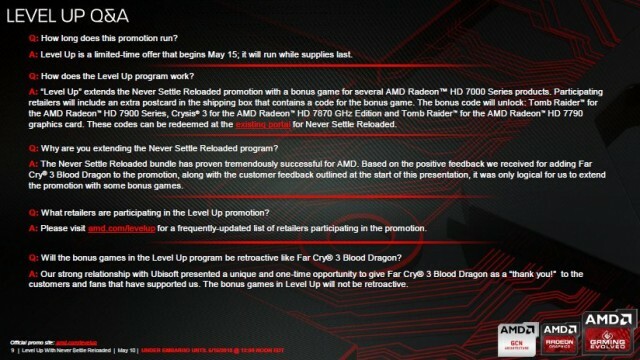 They’ve had some feedback from their customers though, namely “Can you add more games?” and “Why do I have to choose between Crysis 3 or Tomb Raider?” Their answer is the Never Settle: Reloaded Level Up. The first question seems rather silly to me, considering the competition only includes one actual game with their cards (Metro: Last Light), but the second has a point. 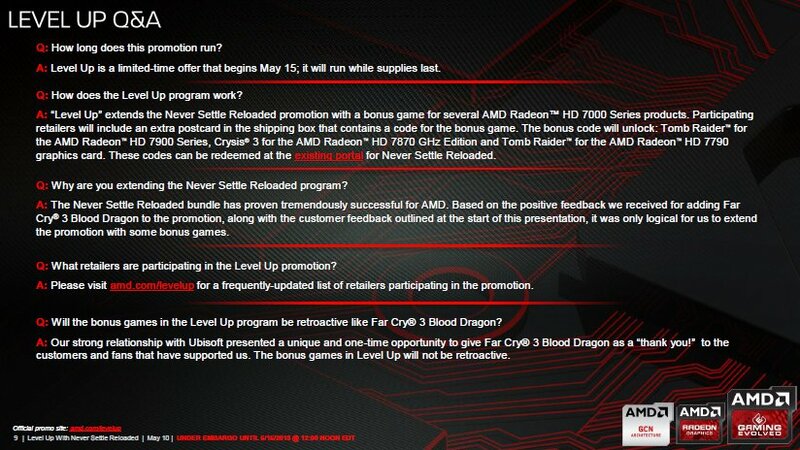 Previously you could only get Crysis 3 with 7900-series cards and Tomb Raider only came with 7800-series cards. Now that has been fixed. They didn’t previously have the option – if you were ‘choosing’ one game or the other, you were really purchasing a different series of card. Frankly, I expected this announcement to mean you were actually given a choice between the two games (while maintaining the same number of included games) regardless of which series you bought. Happily, they exceeded my expectations and are just straight-up including an extra game with both the 7900-series and the HD 7870 GHz Edition (but not the HD 7850). They’re also adding Tomb Raider to the HD 7790 as an extra game, which is pretty substantial considering its quite low price point. Obviously people will have questions, and here are a few of them. The biggest takeaway: This is NOT retroactive like the Far Cry 3: Blood Dragon addition to the Never Settle: Reloaded bundle. This promotion applies to new purchases only. I bet AMD would say it looks like it’s time for CrossfireX! Here is the full Never Settle: Reloaded Level Up (could the name get more cumbersome?) bundle lineup, top to bottom. This is a great value-add for people in the market for an AMD GPU. 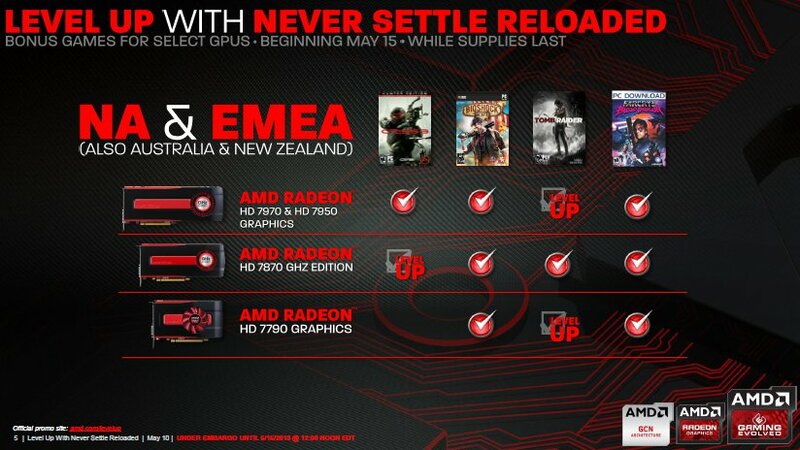 Their GPUs are already very solid in the performance-per-dollar category and these bundles only make them more so. 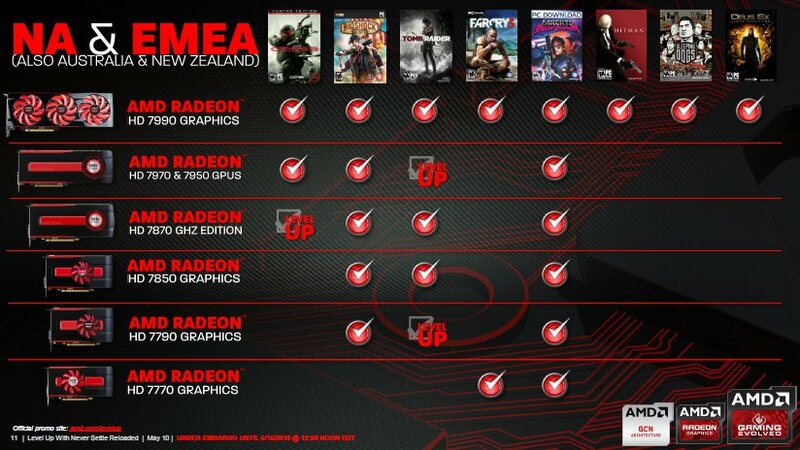 It doesn’t hurt that this keeps AMD GPUs in the news without having to actually release any new cards. No, the HD 7990 doesn’t count since there were two iterations already out there. AMD needs to do something to keep selling now-year-and-a-half-old technology, which still performs very well for itself considering it is long-in-the-tooth in GPU years. Rumor has it that they’re going to be coming out with a ground-up redesign sometime in the fourth quarter of this year. We’re eager to see what AMD’s engineers can come up with to compete with NVIDIA’s now-dominant GK110 GPU (which, granted, comes at a crazy high price premium). 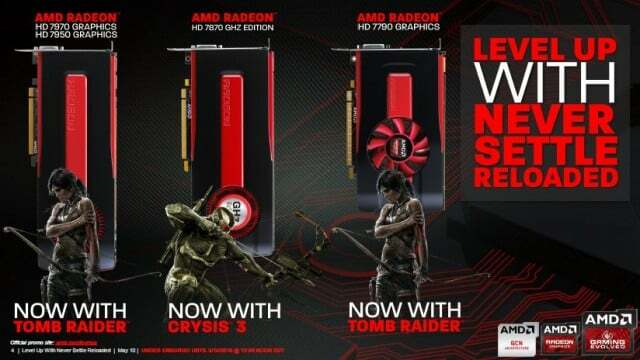 AMD has the value proposition down though, and their game bundles definitely make their cards worth a good hard look if you’re in the market for a new GPU. Who knows? Maybe next we’ll get to see Never Settle: Revolutions in the future. Hopefully it will be better received than the third Matrix. So when is the 7990 gonna be on the market? It is and has been. Link. They've been out, but apparently not in large quantities. Here's the XFX version at TigerDirect. I want the sapphire one, that's the GPU i've settled on... Pun intended. i should also add i was asking because it has yet to be released to the canadian public. Not sure what that's supposed to mean. They have a reference model now, not just the Powercolor/ASUS custom cards that were on the market previously. Not on Newegg.ca I can't get one. It isn't even on the page when i search 7990. We’re eager to see what AMD’s engineers can come up with to compete with NVIDIA’s now-dominant GK110 GPU (which, granted, comes at a crazy high price premium). Erm, its as high as the 7990, in fact it's cheaper. I said it in its review and I'll say it again - IMHO, Titan is an $800 card with a $200 price premium for being the best single GPU on the market. When you're talking 25% over what (again, IMHO) a fair price for that card would be, yes, it's crazy high. Funny. " considering the competition only includes one actual game with their cards (Metro: Last Night), " I believe it is "Last Light", but then I downloaded it Last Night. You got me chuckling. :D Thanks ! Whoops, typo. Fixed. Thanks Robert! Well apparently it is rated mature for that kind of content anyway. Haven't looked at it myself and because of that I don't really want to. Watch the trailer man, it looks as some would say "Hackin' Sweet Man". So does anyone know when it's going to be "released" in Canada eh? Question is, and don't know if it will work out with Steam, can I reassign my coupon code?